Twelve-Year-Old Boy Who Leaped from Street Car Fender and Was Mortally Injured by Automobile. As Edgar Palin, 12 years old, 2802 East Sixth street, jumped from the back fender of an eastbound Independence avenue car yesterday afternoon at Prospect avenue, he was run over and fatally injured by a motor car driven by E. T. Curtis, 3338 Wyandotte street. He died at 7 o'clock last night at the German hospital, without recovering consciousness. With Allen Compton, 400 Wabash avenue, the boy had been playing all afternoon. About 3 o'clock the two lads started northward on Wabash avenue, and at Independence avenue both noticed an approaching street car. "Let's catch the fender," called Edgar, as he waited along the curbing. The car was moving at moderate speed and the boy ran behind, and caught hold of the fender. His companion, 10 years old, ran behind on the sidewalk. At Prospect avenue Edgar, without looking around, jumped from the fender directly in front of an approaching auto, barely fifteen feet behind him. Curtis attempted to dodge the boy. The left fender of the auto struck the child and he was sent tumbling on the pavement. He was picked up by Curtis. Several children were in the auto. With Curtis was Herman Smith, of 3606 Olive street, whose father owned the car. In a nearby drug store it was found the boy had been injured seriously. "I was driving at about fifteen miles an hour," Curtis said. "The auto belonged to young Smith's father and I was running it because I had the most experience. A party of school children were with us. We were taking them for a ride around the block. I noticed the child on the fender and did not have the least idea that he was going to run in my path. I swerved to one side, but the machine skidded and the fender of the auto struck him in the back. I realized at once that he had received a fearful blow." After the child was given emergency treatment in the drug store by two neighboring physicians, he was taken to his home in the motor car, and after being attended by Dr. Max Goldman, was removed to the German hospital. Dr. Goldman found that the boy's spine was broken and that his skull was probably fractured. Allen Compton, his playmate, was in a condition bordering on hysterics last night. The two had been gathering old papers during the forenoon and had just been to the paper mill, where they had received a few pennies with which they intended to buy Christmas presents. "Edgar wasn't no car hopper," Allen said last night, in defense of his friend. "He was just running behind and holding on to the fender. Edgar wasn't that kind." With Judge J. E. Guinotte, a friend of the family, young Curtis went to police headquarters last night and made a statement to Captain Walter Whitsett. After consulting Virgil Conkling, prosecuting attorney, it was decided not to hold him. He promised to come to the prosecutor's office Monday and make a complete statement. He said that he had been running a car for eight years. He is the son of W. E. Curtis, a live stock commission man. The injured boy was the son of W. M. Palin, a real estate dealer in the Commerce building. The body will be taken to Gridley, Kas., for burial. An anonymous letter was the cause of the fight which resulted in the death of L. L. Moore yesterday afternoon at the General hospital where he had been taken unconscious on the day previous. Moore was a chauffeur and had fought with Benjamin Lamon, another chauffeur at Fifteenth street and Troost avenue. It developed that his injuries were due to his fall on the pavement. Lamon is employed by Charles S. Keith of the Central Coal and Coke company. He became angry when Mr. Kieth showed him a letter written by an unknown person which accused Lamon of "joy riding" in Keith's motor car. Suspicion pointed to Moore who was desirous of obtaining a position with Mr. Keith and had written an application for position as chauffeur. The handwriting in both cases were similar. When Lamon accused Moore as the author of the letter at the Missouri Valley Automobile Company, 1112-14 East Fifteenth street, Friday night, Moore refused to make any explanation or denial. A fight followed, and when Moore fell to the sidewalk he struck his head on the curbing, resulting in concussion of the brain, according to surgeons at the General hospital. Lamon was arrested early morning, and yesterday afternoon was arraigned in Justice Miller's court for second degree murder. He pleaded not guilty. He was released on a $2,000 bond furnished by Mr. Keith. Lamon lives at 1525 Oak street and is married. Moore formerly lived at Maryville, Mo., and had only been in the city a few weeks. He worked for Mrs. Amy Cruise of 1209 Commerce building. "Did you ever know a man named Herman Czarlinsky?" When the doctor informed Mrs. Wheeler that the man mentioned, who died here January 27, 1899, was his father, he was informed that Herman Czarlinsky was her father also. She said that her brother, William Whippell, who took the name of his stepfather, lived in Englewood station. A meeting was arranged for last Sunday and an impromptu reunion was held at Dr. Czarlinsky's home, 3510 Vine street. "Shortly after the war," said Dr. Czarlinsky yesterday, "my father married a Miss Goode in New Orleans. She was a Gentile and, on account of religious differences, they separated in 1870. My father came West and settled at Warsaw, Mo., with three of the children, Fannie, G. A. and Charles. Fannie, who is now Mrs. McCubbin, lives at 1625 Jackson avenue. G. A. Czarlinsky lives here and Charles in St. Louis. Two of the children remained with their mother. They were William and Pearl, now Mrs.Wheeler. Father's first wife married again and Will took his stepfather's name of Whippell. Father moved here in 1889. "Nothing was ever known of the other two children and their mother until Mrs. Wheeler appeared at my office last Friday. She said her mother died January 18, 1899, at Monett, Mo., fourteen days before my father's death. "By my father's second marriage there were three children, Mrs. Esther Morris, 3517 Vine street; Maud Czarlinsky, who lives with her and myself. We were, of course, reared with the three children who came West with my father, but neither they nor us knew that the other two were living so close at hand. The mention of my name in the papers as deputy coroner in the handling of the riot victims brought about the reunion." Mrs. Emma Frances Caufield, wife of Dr. E. A. Caufield, 3523 Wyoming street, St. Louis, was instantly killed at 1:30 o'clock yesterday afternoon by falling twelve floors through an elevator shaft in the Commerce building. As the unfortunate woman fell through the open door of the elevator shaft her fingers grasped at the iron grating, clutched it for a brief moment, then relaxed their hold and she fell to her death in the sub-basement, 150 feet below. When her husband and friends reached her she was dead, almost every bone in her body having been broken by the fall. Dr. W. A. Harroun, whose office is in the Commerce building ,was the first person to reach the body. He said that death had resulted instantly. There were only two eye witnesses to the tragic occurrence -- Miss Frances Weatherby, a stenographer in the offices of the Rio Grande Valley Colony Company, who had accompanied Mrs. Caufield to the elevator, and Frank Marks, the elevator operator. The statements of these two witnesses as to the way in which the accident occurred differ materially. Mrs. Caufield, in company with her husband, Dr. E. A. Caufield, had gone to the offices of a company on the tenth floor of the Commerce building, where they engaged in conversation with J. D. Cameron, the manager of the company. Mrs. Caufield suggested to the steographer, Miss Weatherby, that they go to the top floor of the building. The two women left the office together and walked down the corridor to the elevators. "I stepped up to the elevator, and pushed the button to signal them," said Miss Weatherby. "I saw the car coming up and I turned to see if Mrs. Caufield was following me. As I did so I observed that the adjoining elevator had stopped at that floor and Mrs. Caufield was in the act of entering it. One foot was on the floor and of the elevator and the other foot was still on the floor of the corridor. Before she could enter the cage the elevator appeared to start, for I saw her foot raise with it until her skirts were pulled up several inches. It seemed to me that she tried to step up into the elevator, but it moved up quickly and Mrs. Caufield was thrown over backward. "As she fell into the open shaft she clutched at something, I think it was the iron grating, then she fell. The elevator quickly dropped to the level of the floor again, so that if she had been able to retain her hold on the grating she would have been knocked loose by the elevator anyway." In relating her story to her employer, Mr. Cameron, about two hours after the accident, Mrs. Weatherby was in almost a total state of collapse. "I can still see that poor woman as she clung to the grating just for an instant. I was too horrified to move. I just stood and looked, and then she let go and I ran to the office," she said. Dr. Caulfield, when seen last night at his apartments in the Baltimore hotel, was unable to talk coherently. "I cannot believe it; I cannot realize that she is dead," he moaned. "Just look," and reaching over he picked up a photograph of his wife. "Do you realize that only a few hours ago I was with her, alive, well and happy; and now to think -- poor girl, poor little girl." Dr. Caulfield said that when his wife left the office in company with Miss Weatherby, he remained with his friend, Mr. Cameron. "It seemed just a moment until I heard a scream, and Miss Weatherby staggered down the corridor crying that Mrs. Caulfield had fallen down the elevator shaft. When I reached the elevator the operator was walking up and down in front of the cage, and repeating over and over again 'I wasn't to blame. It wasn't my fault.' "
The alarm spread quickly through the building and W. B. Frost, manager of the building, immediately sent word to all the available doctors, so that within three minutes after the accident medical assistance was at hand. The coroner, Dr. George B. Thompson, was notified. He viewed the body and ordered it taken to Eylar Bros. undertaking establishment. "I stopped at the tenth floor of the building and this woman, Mrs. Caulfield, stepped into the car. I noticed there was another woman standing in the corridor. As I shut the gate or got it almost shut, someone said, 'Wait a minute,' Then Mrs. Caulfield grabbed the door. I had started the elevator and was about four feet above the level of the floor when the lady fell from the cage. She fell kind of on her knees and then rolled over into the open shaft. She caught at the grating for just a second, then she let go and fell. I couldn't help her because I didn't dare drop the elevator down on her." For some time after the accident the boy, who has been in the employ of the Commerce building for about three weeks, was hysterical. When seen last night he appeared to have regained his composure, but on advice of Mr. Frost he refused to tell his parents' name or give his address. "The boy has made a complete statement to us as to the way this accident occurred, and this is the statement we have given to the newspapers," said Mr. Frost. To this statement the boy concurred. "What an awful fate it must be to die by falling a great distance." "Mrs. Caulfield was the daughter of J. C. Hewett of St. Louis, and was well known in literary and social circles in that city. She leaves one child, 2 1/2 years old, who is with friends in Joplin, Mo. The father and other relatives will arrive in this city this morning. Telegrams have been sent to the following persons: J. J. Hewett of St. Louis, a brother; Mrs. S. V. Bryden of St. Louis, J. H. Robertson of Des Moines and Mrs. Huntoon of Joplin. An inquest will be held by the county coroner this afternoon. Dr. W. S. Woods has again gained control of the affairs of the National Bank of Commerce. The fact that Dr. Woods controlled a majority of the stock in the bank was made public yesterday morning, and banking circles immediately began to discuss the question. The election of a president was the chief topic, and it is generally conceded that the affairs of the bank have prospered under the management of W. B. Ridgely, president of the bank, and that he will be retained as one of the directors, if not the real head of the institution. Dr. Woods is not a candidate for the office of president, and, it is stated, will simply act as a member of the board of directors and control the policy of the bank. W. T. Kemper, now vice-president of the Commerce Trust Company, has been mentioned as a probable successor to Mr. Ridgely, but Mr. Kemper is not sure what the reorganization will bring forth, and does not care to be quoted in connection with a discussion of a reorganization. That there will be changes among other officers of the bank is assured. W. A. Rule probably will be returned to his former position as cashier, succeeding Edward Ridgely. The reorganization probably will not take place until the annual meeting of the board of directors, January 12, 1909, although under the charter granted by the state changes in the management can be made at any time by a majority vote of the controlling stock. A gradual and substantial rise in the price of stock in the National Bank of Commerce as quoted in trade circles was the first intimation that a fight for control of the bank was being waged. Quoted at prices ranging from $124 to $128 per share three weeks ago, the shares of stock began to rise until last Saturday, $151 to $152 was bid and but little stock was offered for sale. Dr. Woods's efforts to regain control of the bank are said to be the reason for this sudden and unexpected rise, and when it came time for him to show his hand he calmly announced to the directors at a meeting last Thursday of he and his officials and depositors. There has not been a fight between Dr. Woods and W. B. Ridgely. Mr. Ridgely has not sought to control the bank, and his efforts since the reopening in April, 1908, have been devoted solely to building up a strong and stable bank. Under his control the deposits have increased from $12,000,000 on the opening day to nearly $18,000,000 at the present time. W. T. Kemper, vice president of the Commerce Trust Company, who has been mentioned as the probable successor or W. B. Ridgely as president of the bank, stated ysterday that he was not prepared to discuss the details of the reorganization of the bank. He says Dr. Woods has control of the bank and that he is ready and willing to serve in any capacity that will best serve the officials and the depositors. "NOTHING TO SAY" -- RIDGELY. William B. Ridgely, president of the bank, when seen yesterday, stated that he did not care to discuss the subject until further developments were reached. Mr. Ridgely says he will attend to the affairs of the bank as usual, and will give his best efforts to the success of the institution. "I have nothing to say at the present," was the remark made by W. H. Winants, formerly vice president of the bank. "Things are not in shape to be discussed, and we really do not know what will happen. It is better to wait before giving out statements for the public." Other directors of the bank have as little to say as the officers. Dr. Woods still holds his original 1,700 shares, a block of stock he has never increased nor decreased, though he has, during the life of the bank, held other blocks. Since leaving the active management of the Commerce Dr. Woods has been buying shares on his own account and persuading his friends to, until yesterday he and his friends controlled over $1,100,000, or more than 50 per cent of the capital stock. The St. Louis shares are understood to be in the pool. Further than saying that he has enough stock to control the next election, Dr. Woods has not intimated who the new officers are to be. By common consent it was thought on the street yesterday that W. A. Rule would go back as cashier, and as a consequence his offices in the Commerce building were besieged and his telephone was ringing incessantly throughout the afternoon, after then news had got out that there was to be a change in the management of the bank. Mr. Rule declared himself in utter ignorance of everything connected with either the bank or his own home, and instead asked for news. He did not pretend to account for his frequent the East, visiting Commerce stockholders. Dr. Woods has never ceased saying he was sorry to lose his bank. In its darkest days he declared himself proud of it. He was always of the way the present manager, W. B. Ridgely, was running it. The bank has grown prosperous under the direction of Mr. Ridgely, being in excellent shape to continue under its present management or to pass into other hands. "The bank will return to the old management after the next meeting. By the old management, I mean that Dr. Woods will be chairman of the board of directors and he will designate his own friends for president, cashier and vice presidents. I do not think he will take the office of president again. He will make the office of chairman more important, and occupy that. "It is premature to mention anyone for president. The doctor has not done so. He may be expected to renew his old associations. A report that at the time Mr. Ridgely was brought West he had been given the voting power of a majority of the stock for two years was an error. The shares vote themselves and none of them has been pledged. Dr. Woods did not then hold them, so he could not vote them. Now he and his friends do, and they will vote them. "The bank is very prosperous. Mr. Ridgely may be continued. He is a highly valuable man, and the Commerce is big enough to have several big men members of its board. However, Dr. Woods will be the guiding spirit after next January." TO HAVE A RUBBERNECK ROOF. Unique View of the City. Local citizens who delight in showing visitors the new Commerce building, the interior of which is one of the handsomest in the United States, will have an additional attraction to offer in the shape of a roof garden, which has been suggested by W. T. Kemper. The bank building is fourteen stories high and the vantage point at Tenth and Walnut streetsfrom which to view the city. A portion of the roof will be comered with awnings and properly decorated so that visitors may look upon the business section and view one of the most rapidly growing cities in the West. HIS LONG FALL WAS FATAL. Death came early yesterday morning to Charles Pepperdine, the young man who twice in ten days fell from scaffolding sheer down the face of the walls of the Commerce skyscraper. Two borthers who live here were with him at Wesley hospital when he died. His chief concern in the midst of his suffering was that his mother down at Bowling Green, Mo., should be spared the knowlege of his condition. He was her eldest and favorite son. His last drop Saturday morning from the thirteenth story to a substantial skylight in the well of the building above the second floor had mutilated his limbs, and a rope he held to had burned his arm to the bone. Pepperdine's mother and father, who usually live in Kansas City through the winter, went back to their old home at Bowling Green three weeks ago. The men of the family are brick masons and it was in pointing up the work of the Commerce building that Charles Pepperdine was engaged, both on May 6 and last Saturday, when he fell. He was in the habit of laughing at danger and when the first Commerce accident occurred, he and the brick washer who was with him, joked each other as they hung to a rope between the sixth and seventh stories. Saturday one of the two men stood up on the ladder platform and forced it out from the building. A guard rope which both men grabbed for had become detatched and the dangling ropes they caught after falling did not do uch to check their descent. Coroner Thompson will hold an autopsy on the body of Pepperdine this morning at 9 o'clock and the remains will be taken to Bowling Green for burial. L. F. Trout, the other victim of the fall, is said to have a fair chance for recovery. There has been no decided change in his condition. L. F. Trout, 411 Chestnut street, and Charles Pepperdine, 3112 Bell street, were working in the light shaft of the Bank of Commerce building at 2 o'clock yesterday afternoon, when their scaffold broke, precipitating them from the thirteenth to the second floor, a distance of eleven stores. The men landed on the heavy glass skylight just above the second floor. Trout sustained a fracture of the right thigh and a large muscle in the thigh was severed near the knee. Three bones in his right foot were broken and a gash was cut in his scalp. Both of Trout's hands were burned almost to the bone where he held to a steel cable part of the way down. That fact, however, broke his fall and may be the cause of yet saving his life. Pepperdine was more seriously injured and the attending physicians said they had little hope for his recovery. He has a compound fracture of the left knee and right ankle. His right elbow was burned to the bone by a small rope to which he attempted to hold. He was also internally injured. In an attempt to lower the scaffold to another floor, it is said to have swerved and then broken. As the men grabbed for a safety line, which is always on the back of a scaffold, just about the hips, they found that it was not fast. That all took very little time, for they grabbed for the line as they fell, each uttering a cry that was heard all through the big building. Both were taken to the Wesley hospital, Eleventh and Harrison streets. Pepperdine had a narrow escape from death at the same building just about the same time of day on the afternoon of May 6. He, with Paul Jacoby, was washing the building at the seventh story on the south side. In trying to pass the ladder was pushed out from the building. Both men fell from the ladder, but managed to catch the safety rope at the back of the scaffold. Hanging to that they managed to get their toes on the sill of the window below. Then they pulled their bodies up and climbed into the window. Both had received a ducking from a bucket of water which fell from the ladder with them. They went home, got into dry clothes, and went back to work. A large crowd of people on the street witnessed the narrow escape of Pepperdine and Jacoby, but there were few who saw the fall yesterday. The two men treated the accident lightly on May 6, joking each other while dangling in midair. They Make Light of It. 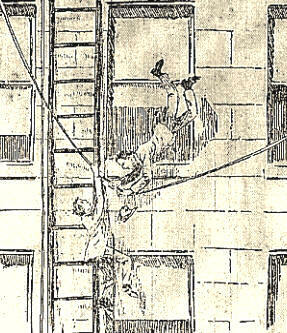 SEVEN STORIES ABOVE THE STREET THESE TWO MEN CLUNG TO A ROPE FOR DEAR LIFE. The falling of a large bucket of water and a brush on the sidewalk on the south side of the Commerce building about 2:30 o'clock yesterday afternoon caused many passers to look up. Dangling from a rope beneath a scaffold almost seven stories above the street were two men. In the crowd which quickly gathered were three women. The spectators all looked on with bated breath while their hands were tightly clenched. Lower and lower the two men dangled. Just as it seemed that one or both would surely lose their hold and drop to certain death, one of the men managed to get the toe of his right foot on the ledge of a window on the sixth story. "Oh Lord!" cried one of the women. "I can't look any more. They're both going to drop!" "Hush up," came from a little nervous man. "You make me dizzy. Don't let 'em hear you say that." This all took place in a very few seconds. While it was going on the man who had reached the window ledge with his toe managed, by a superhuman effort, to draw himself up. Once there, he assisted his companion, whose toe had by that time touched the ledge and both were soon standing side by side in the window. THEY WERE COOL ABOUT IT. "Good boy! Good boy! shouted a spectator. "You are all right." The two men did not appear to hear him. They walked about on the window ledge as if they were on a flat tin roof. One of them tried the window. It opened, the men entered, and the crowd sighed with relief. The two men who came so near death are Charles Pepperdine of 3112 Bell street and Paul Jacoby, who rooms near Fifth and Walnut streets. They work for the Ben P. Shirley Company of Indianapolis, Ind., which has the contract for washing the big building and "pointing" the brick and terra cotta work. One washed while the other "pointed." They were working on a scaffold made from a ladder. Ropes and pulleys are attached at both ends and securely fastened at the top of the fifteen-story building. Men who do that class of skyscraper work become careless. One of the became so yesterday, for, as the two men attempted to pass on the narrow platform, he placed a hand against the side o the building to steady himself. This caused the scaffold to shoot out from beneath their feet. The two men shot off first, quickly followed by the big bucket of water and brush. At the back of the men, just about even with their hips, was a safety rope to keep them from falling outwards. Just as they fell both managed to grab that rope. It was attached to the two upright ropes, or "falls," as they are called. The weight of the men drew the two long ropes closer and closer together as the men dropped lower and lower. It was while in this position that Pepperdine managed to get his foot on the window ledge, and Jacoby was soon drawn to safety. The men made their way back to the next floor and were soon on their ladders, ready to go to work. But as both had got a ducking from the big pail of water, they were excused to go home and get dry clothes. "Nervous? Scared? Who, me? Not much. That wasn't any more than happens every day. Some of us slip or fall a ways, but there is not always a gaping crowd to rubber and make a hero out of the incident." "I was giggling all the time," said Jacoby. "Just like a woman when she is tickled at something and can't laugh out loud. Just like kids in church, you know. I was kidding 'Pep' for the way he was attempting to swim in the air." "No I did not look upon the incident as at all unusual," said Mr. Shirley, who has charge of the work. "It may have looked odd to the people in the street, but when you take into consideration that most every man I have can climb a rope hand over hand for seven stories at least, you can see that that lessens their danger. They are just like cats, always light feet down, and if their hands touch anything that looks like a rope they are sure to grab it and skin right back to where they fell from . Both men will be at work in the morning. They didn't go home because they were nervous." There are two other scaffolds on the same side of the building on which there are from two to three men at work. They laughed heartily at the predicament of their fellow workmen, especially because they got a ducking, and thought the whole thing was a joke. While the Long building as in course of erection a workman was laying terra cotta on the cornice at the very top, fourteen stories from the street. The piece he was laying fell from its place and the man with it. Near at hand was a rope with which the material was hauled to the roof. End over end the man went twice. Then his hands touched the rope and he grasped it, slid a few feet and remained still. After getting his breath he went back to the top, hand over hand, got another piece of terra cotta to fit in the place of the one which was smashed on the pavement, slapped some mortar on to hold it in place and went to work. His hands were badly burned from "skinning" the rope in his fall of thirty feet. Otherwise he was alright. ferred Its Offices to Kansas City. The Cockrell Harvesting Company, Ltd., of New Orleans, Louisiana, has transferred its offices from that city to Kansas City and are located permanently in the new Commerce building. This company controls the patent rights to the first mechanical sugar cane harvester ever built and are at present building the first allotment of these machines for the coming harvest of sugar cane in the South. F. M. Cockrell, Jr., who is president of the company and inventor of the machine, is a son of Francis M. Cockrell, former United states senator from Missouri and at present a member of the United States interstate commerce commission. E. J. Finneran, a well known newspaperman, is general manager of the company.